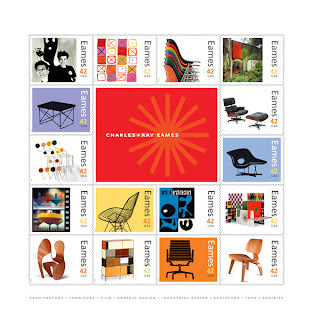 Today, June 17, 2008, in Santa Monica, California, the Postal Service™ will issue 42–cent commemorative stamps of the amazing Charles and Ray Eames. The couple is a long standing favorite in the design world and a staple for inspiration in this house. To reflect the couple’s rich body of work in furniture and toy design, architecture, and film, Derry Noyes, one of six art directors employed by USPS, has created a colorful pane of 16 different stamps featuring some of their iconic designs, including the Low Chair Wood, or LCW, (1945), House of Cards (1952), Hang-It-All coat rack (1953), Eames Lounge and Ottoman (1956), and Eames Storage Unit (1950). Also included is a photograph of the Eames House in Southern California, one of 25 homes built as part of the Case Study House Program. The couple moved into the house in 1949 and stayed there for the remainder of their lives. Charles died of a brain aneurysm in 1978; Ray passed away in 1988, ten years to the day after her husband’s death. Visit Eames Office or Eames Foundation or Design Museum or USPS to learn more about the dynamic duo of Charles and Ray Eames.